Open hot water is 1911. 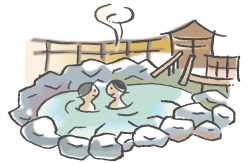 Ideyu Hot Springs blends with shogi piece of special product and brings on unique zero wall mind. Hot-spring resort spreads out nationwide on northeast side of Mt. Maizuru becoming venue of known "Human Shogi". Elaborate monument including the sidewalk of railing and shogi problem of bridge which garnished only town of the best shogi piece amount of production in Japan with piece is meeting. It is kyuikoitoko of bright red Nodategasa Umbrella of proprietresses suggestion that tickles feeling like going on a trip. Let's take a break while enjoying the cool air for wind bell.